I read this article and found it very interesting, thought it might be something for you. 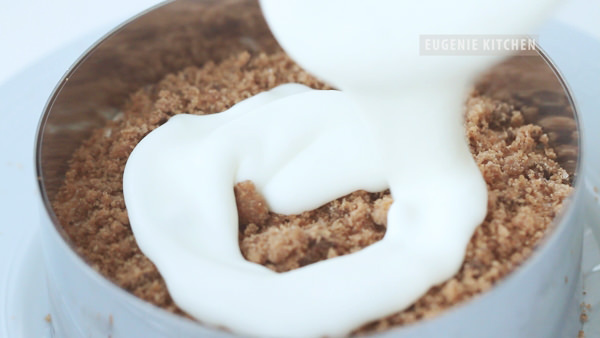 The article is called Chocolate Chip Cookie Dough Ice Cream Cake and is located at http://eugeniekitchen.com/chocolate-chip-cookie-dough-ice-cream-cake/. Eggless chocolate chip cookie dough ice cream cake with homemade no-churn ice cream. Watch this video, it’s easier than you think. First, line with a plastic sheet on the bottom of a plate and arrange a ring over it. Then put a plastic cake ring in the mold. In a bowl, add in 3 tablespoons of softened unsalted butter, 1/3 cup of light brown sugar, 1/8 teaspoon of salt, and 1/4 teaspoon of pure vanilla extract and whisk until homogeneously combined. Add in 1/2 cup of all-purpose flour and mix. Sift flour if you take it out of a tightly packed bag. And finally fold in 1/4 cup of mini semi-sweet chocolate chips. This is eggless cookie dough. Roll the dough into a thin rope. And cut and form a ball. Repeat with only half of the dough. The remaining half will be used later. Now whip 1 cup of heavy cream until stiff. Add in 7 tablespoons of sweetened condensed milk and 1 teaspoon of pure vanilla extract and delicately fold until combined. I don’t add in cookie dough chunks now because with a lot of frozen cookie dough, I cannot cut the cake cleanly. 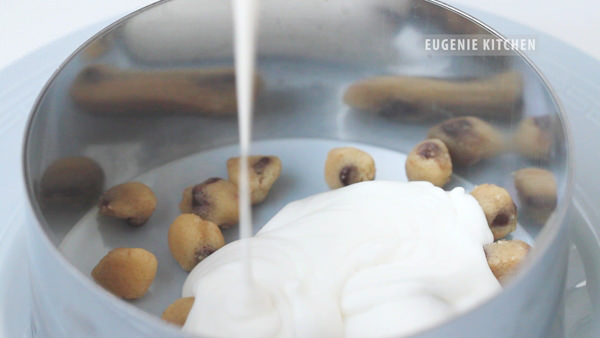 But if you are making just cookie dough ice cream, fold in chopped cookie dough right now. Arrange the balls of chocolate chip cookie dough on the bottom of the ring. And fill the mold with the batter only half full. Then sprinkle with 3 tablespoons of cookie crumbs. Any cookies are okay. Just avoid overly sweet cookies. I have a few cookie recipes in separate videos. And pour the remaining batter in the mold and clean the top with an off-set spatula. Then freeze overnight. Out of freezer, remove the ring. Roll out chocolate chip cookie dough and cut with the ring. Cover the cake with the round cookie dough and turn it upside down. Sprinkle with cookie crumbs and decorate with chocolate chip cookie dough. Homemade eggless chocolate chip cookie dough ice cream cake. If you are making ice cream, why don’t you turn it into a festive ice cream cake? It takes only a little more effort. I love beautiful vanilla ice cream with cookies crumbs and chunky chocolate chip cookie dough. Find the ingredients and ice cream playlist in the description box below. 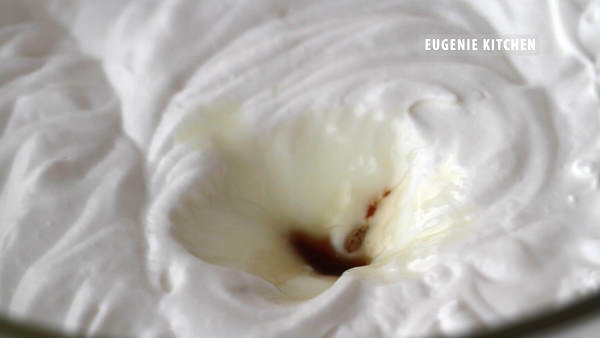 You can also find the full recipe on my blog, eugeniekitchen.com. Oh…my…I have no words! WOW! Hi, that’s fine. Thank you! do u have to bake the cookie dough?